We tested the soil in a few of our fields last week. 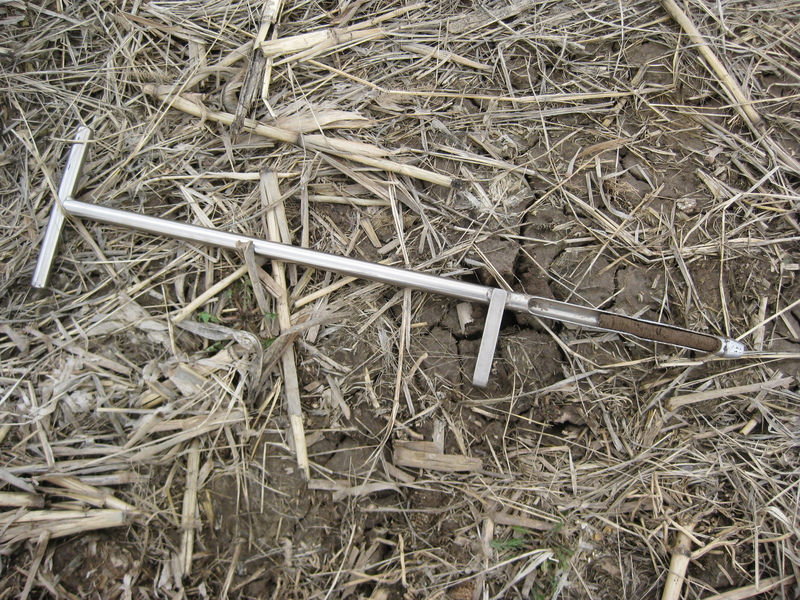 Pictured is the probe, laying on its side, which is pushed into the soil vertically, and then pulled back up, removing a small core of soil which you can see in the bottom part of the probe. It takes five samples to fill a testing bag. We sent our samples to AgSource Soil & Forage Laboratory, located in Bonduel, WI. This is also the first picture in a series showing how this field changes throughout the year. We call this field M6. It was planted to corn last year. It will be planted to oats this year. We last tested this field in 2006. It looks like our management has improved the soil profile in five years. I’ll go through the soil test without much explanation. If you have anything to add, please do. Organic matter increased from 2.1% to 2.9%. pH stayed constant at 7.4. Cation exchange capacity increased from 10 to 11. The next observations are all in parts per million. Phosphorous increased from 38 to 41. Potassium decreased from 109 to 97. Calcium increased from 1285 to 1600. Magnesium increased from 395 to 500. Boron increased from .5 to .9. Manganese increased from 4 to 6. Zinc increased from 3.2 to 10.4. Our soils are different types, based mainly on our management. The soil close to my parents’ farm, next to the buildings, has had a lot of hog manure spread on it over the past thirty-plus years. The soil on my farm has received a lot of hog manure since we built the three hoop buildings in 1996-1997. The cowherd is usually fed hay in the winter on some of this land as well. As a result, the soil is high in phosphorous, and optimum in potassium. The soil on the east hills receives no manure except for when the cows graze the fields. This soil tests low in both phosphorous and potassium. The other farm soil receives some manure, so it’s optimum in phosphorous and low in potassium. Our chosen fertilizer is manure. The problem with manure is it is not perfectly balanced. Our management of the manure and crop removal has caused phosphorous to increase relative to potassium. We are doing a few things to combat this. 1. Managing the spreading of manure better. 2. Feeding phytase, an enzyme which helps pigs digest phosphorous better, resulting in less phosphorous in the manure. 3. Fertilize with potash, 60% potassium, in the fall, when our budget allows. We spread 200 lbs of potash on all the crop acres last fall. Our plan for this spring. 1. Hog manure will be spread and tilled in to all 2nd-year corn fields. Oat and hay fields on my farm and my parents’ farm close to the buildings will receive nothing. 2. Other farm and fields farther from my parents’ buildings received 200 lbs of potash to increase potassium. 3. East hills received 100 lbs of potash and 100 lbs of MAP, 52% phosphorous, to increase potassium and phosphorous. This entry was posted on Sunday, May 1st, 2011 at 3:45 pm and is filed under Curious crops, Curious fertilizer, Curious Square-foot. You can follow any responses to this entry through the RSS 2.0 feed. You can leave a response, or trackback from your own site. You know most of us just drive by farms without ever giving this a second thought. BTW … did you ever get an answer for why your cholesterol nearly doubled on the meat diet? Are you still following it? Thanks Karen. Like most farmers, I test my soil more than myself. Some commenters said I shouldn’t worry with such a low triglycerides number. They also thought I should look at the different particles in the LdL. I hate giving blood. 😦 I don’t like to either. I’m trying to get over my fat-phobia so that I can ironically get this fat off my body. I had noticed your comment on the Eades blog and was curious as to how you made out with your meat diet. I’m trying to alternate between no-carb and low carb days to see if I can jump start my fat loss. It seems many are very successful with it. Have a great day! It’s finally not raining here in Southern Ontario! Hope it’s wonderful where you are.